As I said the other day I want to talk a phenomenon that prepares you for when, later, I discuss the topic of black holes related to quantum mechanics: The Pauli exclusion principle. As you know, roughly, things that are composed of atoms, are (in turn, by atoms) composed of electrons, protons and neutrons. And, as I said long ago, these elements can be divided further into fermions (“thing”) and bosons (“force”), so that, for example, an electron is a type of fermion called lepton (to annoy) and fermions have a wave equations that “govern” their movements. This, I hope, have it clear for the times I have given the turra about it and but, in light plan, you can always look at my blog to cool. 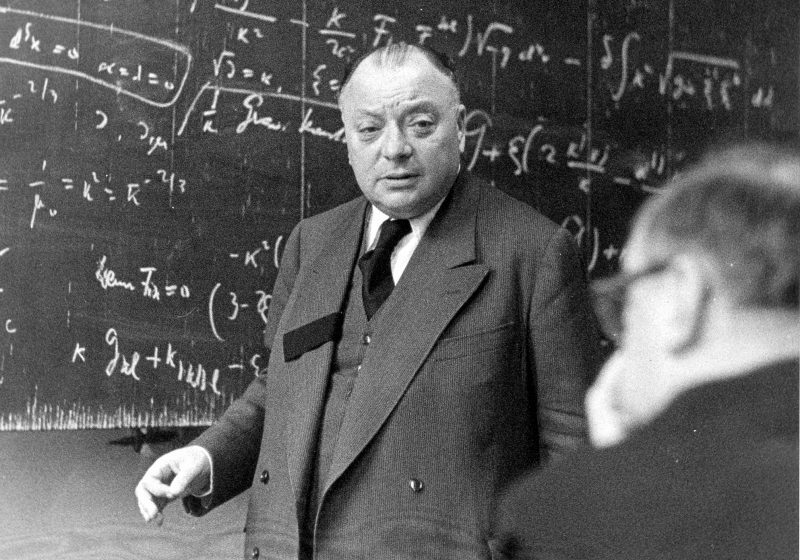 Well, Wolfgang Pauli, Austrian physicist / German parent of quantum mechanics (along with others) knowing that the “basic” elements (neutrons, protons) were composed by others gave for taking the periodic table of highly known elements and ordering or ordering to know because that way for their fermions. That is, instead of looking at the atomic weight and order for its content, gave him think that perhaps it would be better to order it by its elements “quantum” and its spin. For if we were doing wrong. In this way, he realized that the elements, their wave functions could not be in the same quantum state. That is, it sounds complicated this is quite simple, like everything in physics. As we know, an electron, a lepton for friends, is a fundamental particle and part of the atom. Atoms are “neutral” charge (standard) then the periodic table sorts them by the amount of them you have (other than by the atomic weight, the horizontal lines are elements with the same number of protons and electrons). Then there are atoms with more than one electron and these, each electron has a wave function “he tells us” as it moves within the atom. So far so simple. What happens if more than one electron in the atom wave functions? as they are?. Pauli, with its principle tells us that simply can not be in the same state, they can not have both the same equation. And who says two said three people say three … well, you know. The Pauli exclusion principle not only applies to one atom alone in the world but to set them. That is, the elements exchange electrons between them (come on, either by passing current, copper, for example) are also affected by this principle since the electrons that “shared” between various atoms can not be with the same function cool. That is, if an electron is shared between two atoms, it will be in a function that does not match or that of an atom or the other and if two electrons share a power state, an orbit, as they have to have something different whether or if, the only thing left to them to be different it is the spin. This principle is important for the collapse of matter, where the antagonistic forces of gravity can do nothing but the Pauli principle is maintained. Something that, I will tell you… sometime.